Heya, Know you;re still working on it but u asked… the rollover still pops up on the right side of the pointer when I go to the right side of the screen – can’t read it all the juicy opening details of the open-to-all gmail story on the bottom right. Had to click. oh metrics are playing in my head (sung to raindrops are falling on my head) and that I will take as a sign I should go-to SLEEP. night! Ibrahim: I had moved the swf for a while and hadnt updated the url so sorry abt that. Dana: yeah i know…havent looked at the mx Tootip class to find out if I can cleanly position the tips the way flex components do by default. I am a Information Design Student from India. I was researching for some material regarding TreeMaps and I came across your blog. 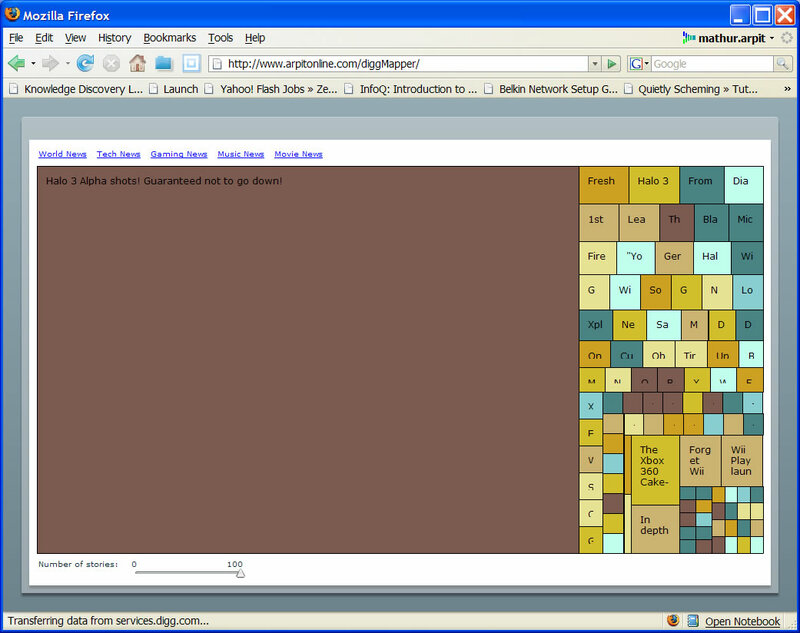 The DiggMapper application interested me. I do have a few questions related to the colours used.. I found that there was a repitition in the colours used in one particular category results. Is this to imply sub categorization in one category.. And if so.. what was the basis of the choice of colours used.. Please throw some light to this topic.. Previous Previous post: Squarified Treemaps with source ! !